Who would have thought that a girl like me would get hooked on a moisturizer? It was something I couldn't fathom, more so my friends who are only so aware on how oily I am. But I can't deny the benefits that it gives me. It is truly something that I can't live without. Hence, the HG attached to it. When I got invited to have a one on one consultation at the Clinique counter located at Rustan's Makati, I couldn't help but say yes. I was already a Clinique user for quite sometime and I thought that another consultation won't hurt. During the course of my consultation with Baby, I told her a skin problem I've been having lately. Despite me being oily, I've been having bouts of rashes along my jawline that results to redness, itching and afterward, drying of the skin. It has only been prevalent during this season. Oh, hot weather, when will you go away? After consultation, she got some products which she recommends that will work with my present skin condition and also to address some skin problems I have. Given that I was in the number 3 category, I was given the Clinique Liquid Facial Soap, Clarifying Lotion 3 and Dramatically Different Moisturing Gel. Additional are the Clinique Turnaround Concentrate and Mosisture Surge. Boy, was I shocked to see the Moisture Surge Extend Thirst Relief along with. Do I really need that? Given that I was having some dryness, Baby recommended Moisture Surge to keep my skin hydrated. Since I was skeptic, Baby asked for me to try it. But I had makeup on, I told her. She then told me that I can use this even on top my foundation. Manners only stopped me from saying, "Wehhh?" True to her words, I dab on a sizable amount of Moisture Surge on my face. It really felt icky, like most moisturizers that I've tried. I felt conscious of it sitting on top of my mineral foundation. 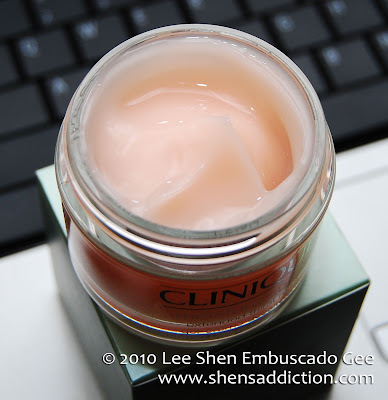 But my mind starts to wonder as Baby, May, Budit and I started to talk more about Clinique products and philosophy. Lo and behold! Was that my reflection looking back at me with fabulous looking skin? Was it? Was it? It was! I was completely shocked to see how different and yet the same I look. Suffice it to say that I looked.... pretty. (sorry if I sound boastful here. forgive me?) My skin looked clear, hydrated and glowing. 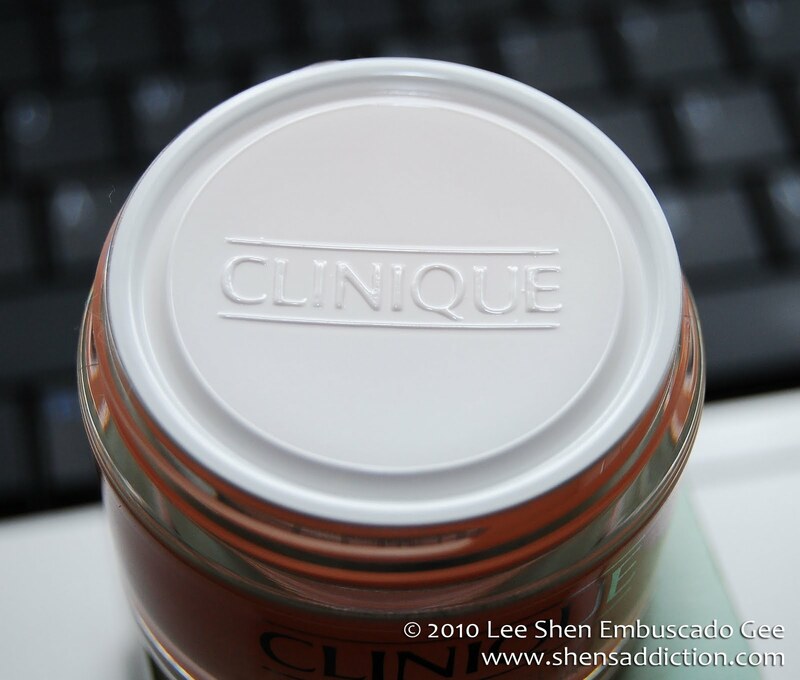 If you've been to Clinique, you'd know that the lights around the counter is white and all too showing of flaws... I hardly saw mine. I was so excited that I exclaimed how pleased I am. I ended up getting myself one jar of it! Light, comfortable cream/gel plumps skin with hydration for a full 24 hours. Fine lines, flakiness and tightness are washed away. In their place—a sense of supple, firm, vibrant well-being, even through shifts in humidity. One ‘drink’ and skin looks and feels happier, healthier. I chatted up Nikki of Askmewhats immediately when i got home. I told her how right she was with Clinique Moisture Surge and that I do get what she means when she says its an holy grail product. Hefty the price may it seem (Php2,500/50ml/24months), but this is one product that I use day and night without thinking twice about it. I feel refreshed and rejuvenated in the morning after being exposed to the air-con. And during the day, my jawline doesn't feel tight anymore and I hardly feel itchy. Icky and wet, that's the initial feel you'll get upon application. But take it from me that this feeling will go away after sometime. I never really thought my face need that much hydration until I tried Clinique Moisture Surge. It was heaven sent I received that invite. Such feeling will be compensated by the fabulous scent (which is actually not really a scent) because all Clinique products are fragrance free). It just smells good that even when I have a migraine, I don't get scent-sitive with it. The gel also feels cool on my skin that on hot summer days, I quickly dab this on my cheeks, forehead and jawline. Sometimes even around my decoletage. I remember when my grandmother use to have this on her vanity fridge. How I wish I harbored it away from her before she got back to the States. Hmm.. maybe I could ask her to send me some. The jar was way to big to tote around and being a stickler for hygiene when it comes to such things, I transferred a small amount of the Clinique Moisture Surge Extended Thirst Relief on to a cream pot from Beabi (Php35.00, i think) and kept the rest inside the fridge. Just like what grnadma does. How about you? Have you found your HG Moisturizer? Maybe you should try Clinique Moisture Surge Extended Thrist Relief? Remember that even those with oily skin need a moisturizer, too. 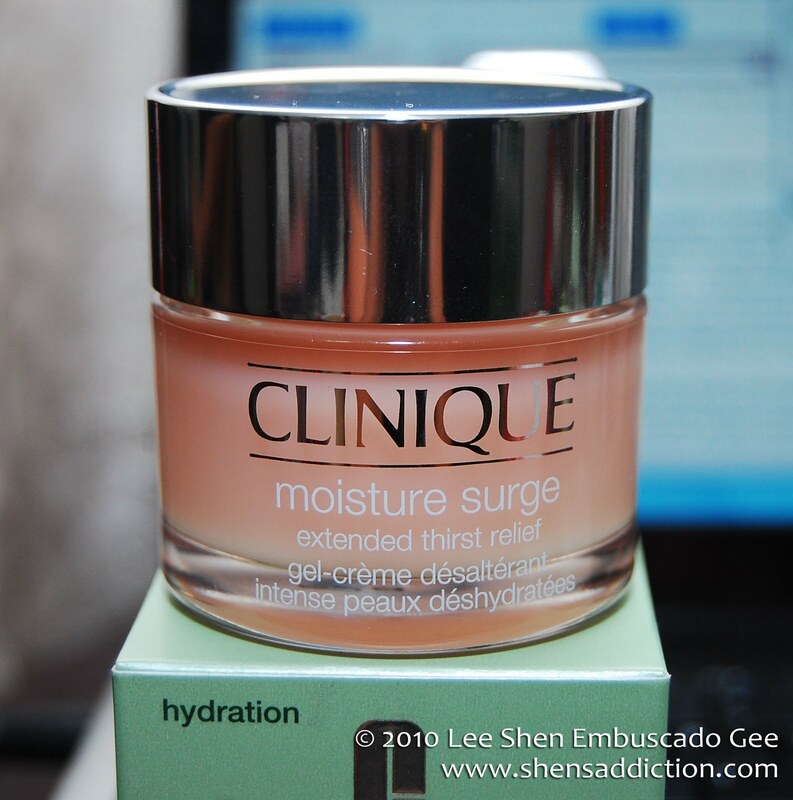 Clinique Moisture Surge Extended Thirst Relief is available at all Clinique counters located at Rustan's Makati, Rustan's Shangri-la and Marrionaud Mall of Asia.